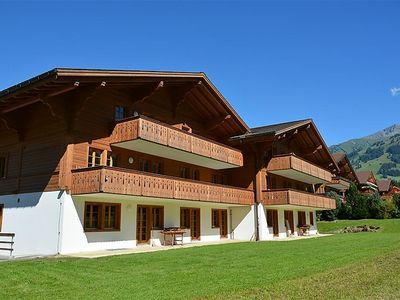 This ski-in / ski-out chalet is fabulously located in the winter and a pleasure to stay in for summer. 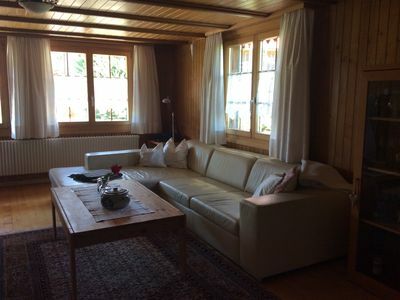 The chalet has been decorated very personally and tastefully, making it a real home-from-home. You are bound to find something to entertain you among the games and huge DVD collection. 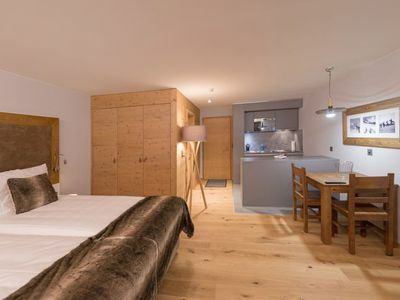 One of our most popular chalets in La Tzoumaz Ski-in Ski-out Chalet Mont Rose has a high number of repeat guests so book your ski holiday early to avoid disappointment, particularly if you wish to ski over the Christmas or half-term periods. 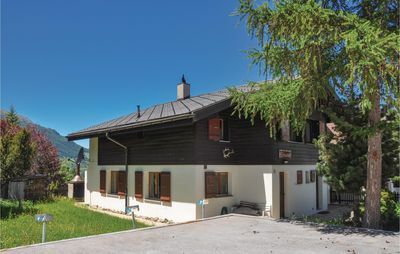 This four-bedroom chalet is ideal for 8 adults or up to 6 adults and 4 children. There are two double bedrooms, a twin bedroom, and a fourth bedroom that is perfect for children with its sloping roof and up to four beds. There are two bathrooms, one with a shower and the other with a bath. 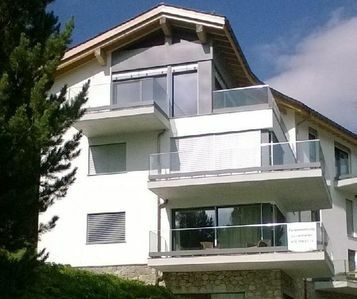 Chalet Mont Rose is equipped with a cot suitable for children under 2 years old. The main floor of the chalet is an open kitchen/living/dining area. The kitchen is fully equipped with everything you might need, including dishwasher, microwave, electric filter coffee machine and even a Nespresso coffee machine. 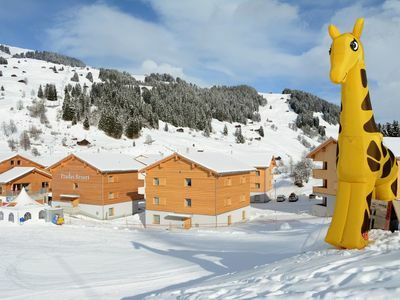 There are fondue and raclette sets for a traditional Swiss evening in front of the log fire. Washing machine, dryer, hairdryer, iron and portable outdoor barbecue are all available for you to use. In summer there is a full-size outdoor table tennis table (bats & balls loaned on request). 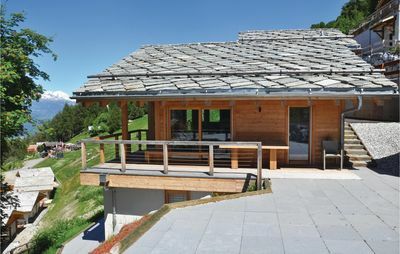 The beautiful panoramic views and the mountain air are relaxation defined, and from the terrace and balcony you can even see and hear a small stream running past the property. 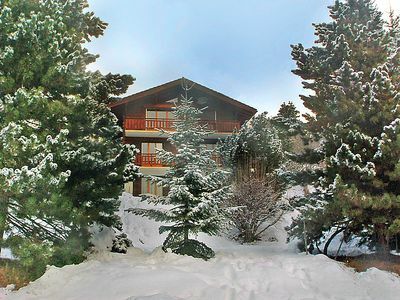 The chalet is equipped with flat-screen Cable television and an extensive DVD collection. Don't forget to bring your MP3 player to connect to the modern "SoundSticks" stereo system in the lounge. 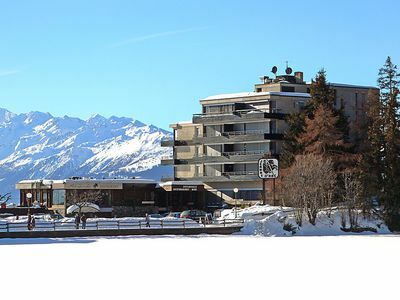 The nearest ski-bar is only 400m away at the main piste. In summer, the flat garden area and terrace is ideal for sunny barbecues and table-tennis tournaments. 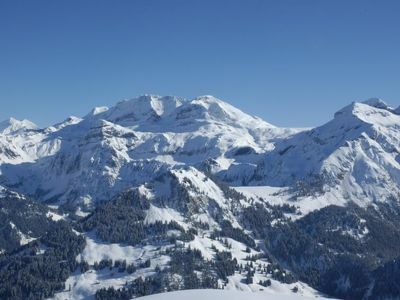 On a blue-sky day, the view stretches 20km, up to the peaks of the Haut de Cry and the Mont Gond, and in the other direction towards the legendary Vallon d'Arby from where good skiers can ski home to the door. 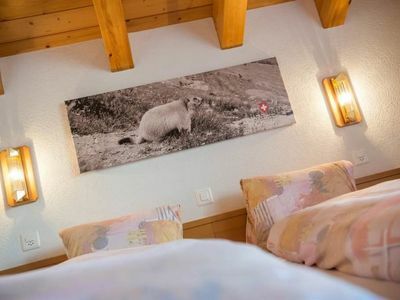 Chalet Mont Rose is equipped with free WIFI for your own private use. 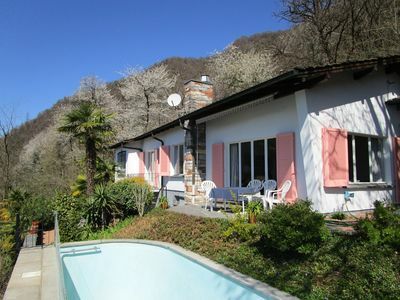 We would be delighted to welcome your pets to Chalet Mont-Rose. Please note that in order to cover supplementary cleaning costs, pets are charged at a rate of 3 CHF per day payable on arrival. If you are travelling with more than one large or two small dogs, please contact us to ensure we will be able to accommodate them. 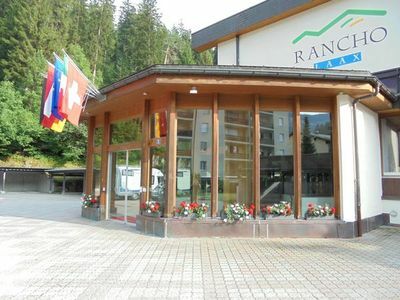 Parking for 2 cars outside the chalet. Winter tyres and/or snow chains necessary in winter due to frequent snowfalls. Contact us for railway or airport transfers. 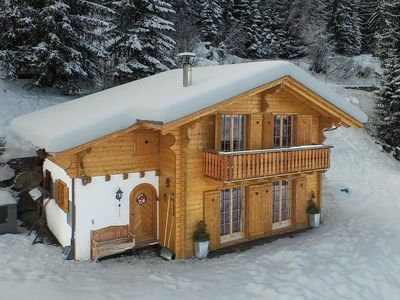 This chalet is ski-in and ski-out. 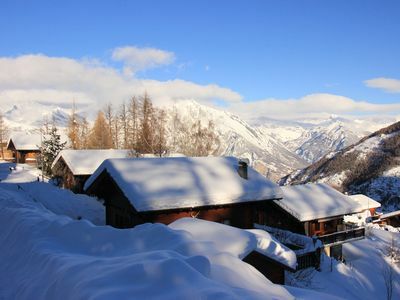 The footpath at the side of the road is prepared and maintained for skiers during the ski season, allowing you the luxury of skiing the 400m to the main ski piste and down to the Savoleyres telecabin and also skiing back home at the end of the day. This ski-route is suitable for all except complete beginners, who would need to walk the 400m to the beginner skiing area. The modern high-speed telecabin carries you from La Tzoumaz up to the top of the Savoleyres in less than 8 minutes, from where you can decide to ski back on the quiet La Tzoumaz slopes or ski down to Verbier’s legendary slopes and world-class off-piste opportunities in the vast 4-Valleys ski area. 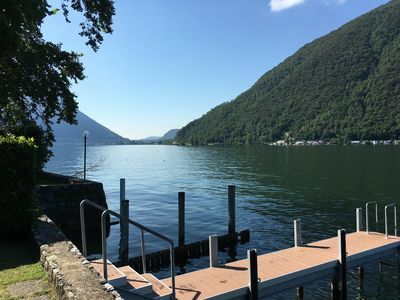 In summer, the area turns into a hiking and mountain biking paradise, with hundreds of kilometres of marked trails criss-crossing the mountains, awash with alpine flowers and a range of wildlife to spot. Visit the Maison de la Foret with its wildlife exhibitions and its Five Senses Nature Trail, and the starting point of many beautiful hikes. The 'Bisses' are relatively flat footpaths that follow the water as it trickles around the mountainsides, where for centuries farmers and villagers channelled the streams for their own uses. 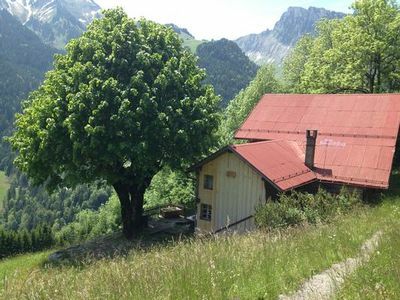 They have been preserved now and can be an incredible way to spend a day or more on easy hikes with stunning views across the Rhone Valley or over to the Massif des Combins. We’ll provide you with plenty of tourist information including our favourite suggestions for day trips that are easily reachable from La Tzoumaz, from spectacular gorge walks, cheese factories and roman festivals to rainy-day ideas such as underground lake tours. The road that winds up the mountain-top to the panoramic Croix-de-Coeur Cafe-Restaurant opens as soon as the snow melts and from here you can continue the drive (or cycle) all the way down into Verbier. 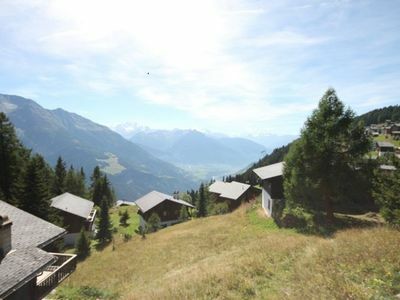 Don’t miss the Swiss National Celebrations in La Tzoumaz on August 1st, or the famous festival of live music performances, the Verbier Festival, which runs from mid-July to the beginning of August. tourist taxes for the number of adults/children stated at time of enquiry/booking. Please note that due to the inclusion of tourist taxes in the calculation, the price varies according to the number of people who will stay. Adults are classed as over 16 years, and children from 6 to 15 years. At the time of booking there is no need to declare (or pay for) children under 6 years old on the date of travel, however please mention them in the "Special Requests" box so that we can include them in our arrival preparations. 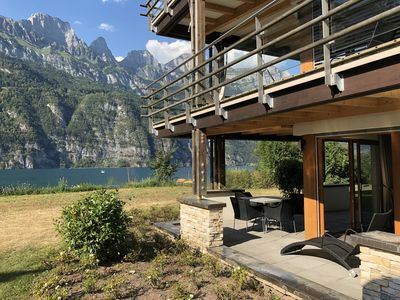 We do not debit or hold any money for the breakage deposit - instead you will be asked to sign a credit card slip on arrival for use in case of breakage unpaid at departure (up to 1000 CHF). The slip will be destroyed when no unpaid damage is found after your departure. We operate a strictly "first-paid = first-reserved" basis for bookings so we cannot guarantee availability beyond what you see on this online booking portal and so we recommend you confirm within 48h in order to secure the reservation. You can book and pay by credit card right now through the secure online booking portal using the link on this page. 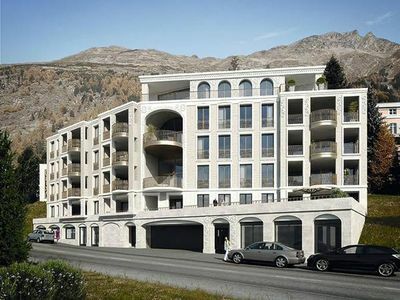 50% of the total amount is due upon reservation and the remainder is payable 2 months before arrival. 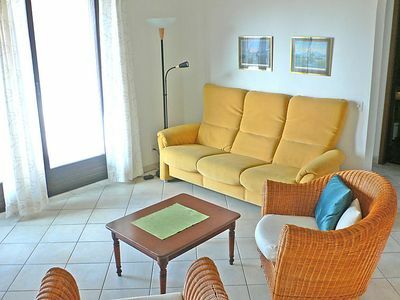 In case of cancellation: Up to 2 months before arrival (or upon resale) the fee is 15%. Up to 1 month / 80%, thereafter / 90%.